The most used words on my blog, arranged into a “word cloud”. Spotted on GadgetVicar‘s blog. 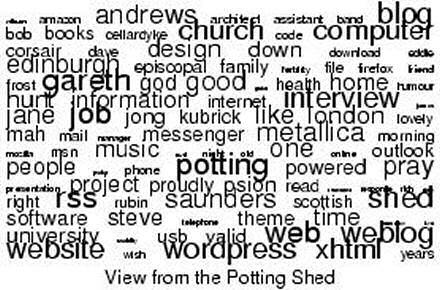 From Snap Shirts: you can instruct their box of computer magic to trawl your blog and it will produce an image showing a word cloud of the most often used words on your webblog; the more a word is used the larger it appears in the cloud. What if Microsoft packaged the iPod? My friend James pointed me to this earlier today. 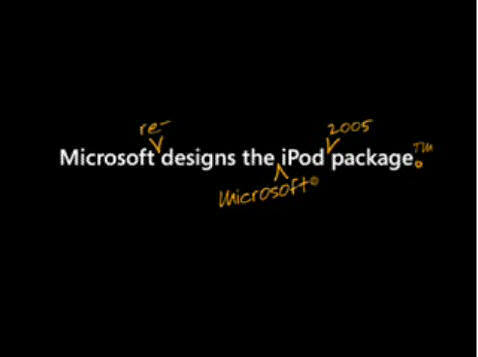 It’s a short film parody on You Tube showing what the Apple iPod packaging might have looked like had Microsoft been responsible for it. Geeky question: if anyone can tell me what fonts are used in it, I’d be very grateful. Particularly the handwriting-style font. Posted on Monday 27 February 2006 Saturday 28 July 2018 Categories ComputerTags Computer, humour, PC2 Comments on What if Microsoft packaged the iPod? If it’s for you, it’ll not go past you! 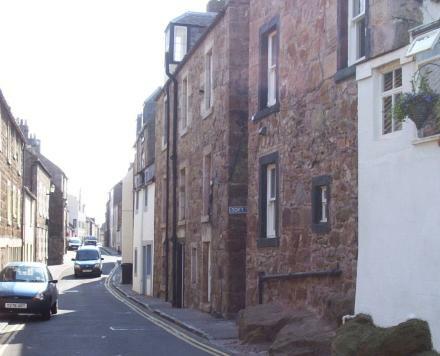 View looking down George Street, Cellardyke. Toft Terrace is the lane leading off to the right. What an incredible couple of weeks these have been, filled with friends (Steve and Cath, Steve and Lorna, Peter, Rich and Andrew), the amazing news about a new job — I promise I’ll shut up about it soon, but I’m still so excited! Then Scotland beat England at Murrayfield on Sunday, and all-in-all it’s been a fortnight packed with more than a little blessing from God. The next exciting part of the we-have-to-move-to-Fife adventure is that we think that we’ve found a place to live. Now, I suspect that some of you will probably be thinking that’s fairly obvious because we have a holiday cottage, Kadesh, at 50 George Street, Cellardyke, which is within the 25 miles of St Andrews radius that the University requires me to live. And they would be right, but we can’t move in. Not yet. First, we have a contract with Interhome that we must honour, meaning that we’ll not be able to get into the house ourselves until early September at the earliest. Second, the house isn’t big enough for us. So we’ll have to extend. So Jane and I decided that our best bet would be to rent somewhere, unfurnished, while we see through the Interhome commitment and transform Kadesh into Kadeshim. 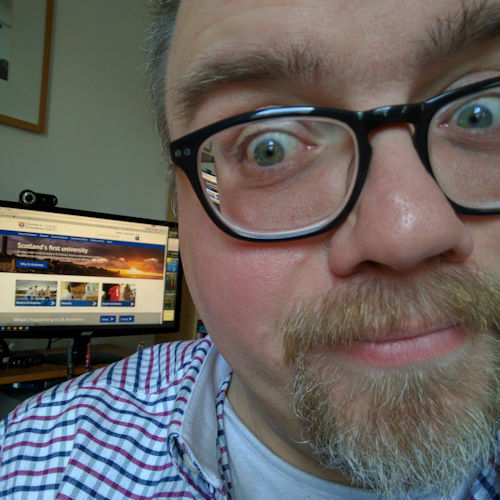 So, the other night Jane asked Mr and Mrs Google to look into Big Boy’s Book of Interesting Internet Things™ and see if they could magic us up a nice, unfurnished house in the East Neuk of Fife. And there was one. There was one! Jane found us a nice, unfurnished, three-bedroom house in Cellardyke, of all places. That’s handy, you might be thinking. Well, it’s even more handy than you’re imagining. It is so handy it’s right next door to Kadesh! It’s situated on Toft Terrace, which you can just see on the photograph above — there is the end of a blue road sign saying “Toft” on the end of that house to the right of Kadesh (the blue and white building), and so it backs onto our garden! Our neighbours in Cellardyke, Ian and Yvonne, have been saying for months that we should move closer. Well, we might just do that, and if we get the rental of the Toft Terrace house then we’ll certainly be closer, we’ll be literally living right next door. How cool is that?! How cool is God for helping us in setting all of this up?! (Very cool, is the answer to both of those questions, in case you were struggling for the answer.) I’ve often heard people say things like “If it’s for you, it’ll not go past you,” and “If it’s meant for you, it will happen.” I think I might be beginning to believe that now. Posted on Monday 27 February 2006 Tuesday 16 April 2019 Categories GeneralTags Cellardyke, job4 Comments on If it’s for you, it’ll not go past you!